Accounting for around half of mobile transactions in countries that are developing mobile payment systems, this pressing demand has allowed these new systems to grow quickly to meet demand. MPESA: pioneered mobile payments in Kenya, allowing people to access banking services and send remittances using their mobile phone and airtime resellers. 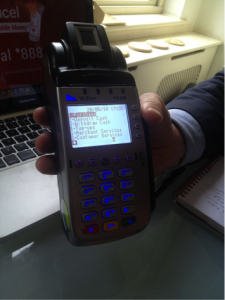 Verifone Mobile Money: Combined biometric readers with mobile chips that will turn any credit card terminal into a banking service, and registered users can use services on the mobile alone. The Verifone Mobile Money credit card portal can scan biometrics, be operated in any language, and can be completely customized for individual needs. Online platforms that allow merchants to accept payments from all credit cards and directly through online accounts, mirroring a Paypal system, but focusing on low-income populations. FloCash: focused on providing a purchasing platform, money transfers, and allowing financial intermediaries to reach the millions of unbanked customers across Africa. Most importantly, it allows payments between African countries, thereby opening up new markets. AliBaba: An online marketplace similar to eBay, focused on globalizing the market of small businesses in China. They have since expanded their purchasing platform Alipay, as well as logistics and cloud computing services.